Speeding of traffic through communities in District 18 is a safety concern. More “speed radar” signs are requested – at least one for every community – and a great RCMP presence. thing. I was wondering if you have any budget here to address, really, the speed through these communities to improve safety. to do that. We’ll continue to do that. Mr. Trivers: So can you commit here today that there’s actually money in this budget so you can add these speed radar signs to, say, coming into the community of New Glasgow? Coming into the community of Wheatley River? Because I don’t know how much they cost, but I would say your department says time and time again, I think you might have even said on the floor: If you save even one life then it’s worth the expense. This is a relatively low-cost item and I think it could help a lot. I agree with you. The Scales Pond Road and Newton Road roundabout, other than the huge expense of $900,000, I think is going to be a good thing to help slow traffic and reduce accidents there. But, obviously we can’t put roundabouts in through most communities. Will you commit to actually getting some of these speed radar signs? and that will encompass all of those types of things in regard to other support structure, reflective materials – so there is a budget line in there. It’s reviewing and looking at the area that needs to be addressed. There is a budget line. You asked, I believe, if there was a budget line, but I’m not making a commitment today on any specific community. Mr. Trivers: I made this request and I made it before. I made the request to you. Are there other people I should lobby and so we can get some action on this? Ms. Biggar: Well, we’ll work together as a department with the community. Mr. Trivers: Last time I checked, I represent the community. Ms. Biggar: We will work with the community. Mr. Trivers: For the unincorporated area, at least in my district, so I’m here on behalf of the community asking you to put those in. Ms. Biggar: Thank you. I’ll take that under advisement. Mr. Trivers: Thanks, Chair. One thing that I’ve noticed really helps a lot within communities, especially with the lower speed limits under 50 kilometers an hour – and I think we’ve discussed this before – are the speed radar signs. Is there budget here in the safety area to buy more of these radar signs to put in the smaller communities across the province? I know especially in District 18 there’s a number of them that would just love to have that, and I think it would really, really help when people come into the community to slow them down. Mr. Trivers: Okay, thank you. Ms. Biggar: – we can talk about it more, but just to answer it now, we do deal with those on a one-off basis as there’s nothing in the budget line, no, for those to say we’re going to buy ten of those digital radars this year, but we do deal with the community as it comes up. Mr. Trivers: Thank you, Chair. I realize this is in the traffic operations. It’s just something that I’ve been asking for for a couple of years now, and if you want I can email you the names of the communities where they’re needed. Mr. Trivers: If that’ll help. Ms. Biggar: We do work closely with the communities, so – thank you, though. Mr. Myers: I’m looking for one on the 48 Road. Chair: Thanks. The hon. Leader of the Third Party. Ms. Biggar: And I’ll talk about the philosophy around speed reduction later, when we get to that section. I am writing you with respect to your portfolios as Minister of Justice and Public Safety and Minister of Transportation because motor vehicle speeding continues to be an issue in almost all communities in my district. This includes New London, Stanley Bridge, Breadalbane, New Glasgow, and even Hunter River (where speed radar signs are already installed). By the way, thank you for any work you did to get a speed radar sign in North Rustico. Speed radar signs do help reduce the speed of motorists, and I would urge you to provide them to all communities that desire them. “Mr. Dumville: Thank you, Mr. Speaker. Minister, in the past couple of years the RCMP has disbanded its five-member traffic services unit. In light of these tragedies, would the minister consider discussing this with the commander of the RCMP and see about reinstating this traffic service that concentrates solely on traffic violations? Speaker: The hon. Premier. Premier MacLauchlan: Minister of Justice and Public Safety. Mr. Trivers: Thank you, Chair. Speeding is a huge issue in District 18, Rustico-Emerald, and I’d imagine many other places on the Island, especially going through communities. Mr. Trivers: In my district I have got lots of different communities; Rustico, North Rustico, Breadalbane, Wheatley River, Hunter River, Stanley Bridge, New London. Almost every one of them, Emerald, they say, people are going through, they’re not obeying the speed limit. I mean I’ve talked to your department many times about this on behalf of the various different communities. I do understand that speed is often a subject of the slope of the road and how naturally it is to travel at that speed and all these sorts of things. One thing that we have talked about with the department and I know we have traded emails, too, minister, is use of the speed radar signs. Basically, they tell you what your speed is. In particular the ones that if you are going over the speed limit they have the lights that flash at you. Those have proven to be, at least, somewhat effective in slowing down vehicles. The problem is, of course, there are not many of them. I know for municipalities, you basically said: You’re on your own. You have got to find money in your budget to buy those and put them in. That would have been covered under the infrastructure section here, more money allocated to that. In the unincorporated communities, I would really love to see those installed. Frankly, in almost every community just because it is such a huge problem. I was wondering if you have any plans for that, or if you’ve allocated any money to make that happen. Chair: Members, I don’t mind you taking your conversation outside the chamber so we can hear the questions and the answer. Thank you. Minister? put those flashing warning signs out for a period of time. I think if you look at it, it would be quite cost prohibitive to install those in every community right across PEI. I would encourage any resident to, if it’s an ongoing issue, to engage with highway safety. We have done that on the main highway, as you know. We had issues with speeding where the bus zones were. (Indistinct) We set up speed checks which we were able to have a lot of people ticketed for that, so – we can make arrangements if it’s an ongoing issue in a particular area to have highway safety come in or deal with the RCMP. I would encourage people, if it’s an ongoing problem, to call the RCMP first of all if it’s not in a municipality that has their own police force because ultimately the RCMP do have the authority to enforce the speed limits. Chair: The hon. Member from RusticoEmerald. Mr. Trivers: Thank you, and just for the record, really it is an ongoing concern in all the communities that I mentioned, even within the district, and I think we really need to show leadership on this issue, put safety first, and make this happen. We need to take action to allocate money. Sharing the signs isn’t going to work; temporary signs aren’t going to work. I think you should even consider, as we’ve discussed in the past, things like photo radar because the RCMP can’t be everywhere all the time either. I would just urge you to consider that, and it’s unfortunate that we’re not seeing any of that in this budget. Just consider it for the future. Thank you. Chair: Question. The hon. Member from Rustico-Emerald. included in the budget. For example, in Hunter River there’s the speed sign so it shows you the speed of the vehicle as you’re coming in and the driver actually sees whether they’re over or under the speed limit. Because those are the sorts of signs that may be needed in other communities. Ms. Biggar: That’s actually not in this section, it’s under the traffic section. Mr. Trivers: Oh, so this wouldn’t include any signs. Ms. Biggar: No, not this section, that’s further on under the traffic side. Mr. Trivers: Okay, I’ll ask my question when we get there. Ms. Biggar: Sure, it’s a good question. areas that are of concern to people. We can move them from area to area at different times. Right now we work with a number of members – the hon. Leader of the Third Party and the hon. Member from Borden-Kinkora – about the Tryon area. We had them installed there just recently, the flashing speed signs. Mr. Trivers: Right. Ms. Biggar: – usually we place it there for a couple of weeks on a smaller area. Mr. Trivers: – in Hunter River. Ms. Biggar: – wherever they want to. Mr. Aylward: Stratford has them. Ms. Biggar: – patrols in that area might help. Chair: The hon. Member from Rustico- Emerald. Mr. Trivers: – was about signs. For example, with school bus stopping-type signs. Ms. Biggar: I know in fact on the road where I live, right in front of my house, one of the neighbours requested one be installed. It took a couple of years to process it all and eventually it was put in place. But it’s a simple sign: School bus stopping ahead. Mr. Trivers: Recently, in fact during the election campaign, I came upon an accident that was caused by a blind hill on Route 2, a school bus stopping. I was wondering what turnaround time we should expect on requests for those sorts of signs. Is there an assessment process that happens? Ms. Biggar: Obviously they come out and they do a traffic assessment and those things. Ms. Biggar: But we’re always willing to work together. If there’s a real area of concern, just bring it to our attention. Mr. Trivers: Because placing those sorts of signs isn’t a high cost thing, necessarily. 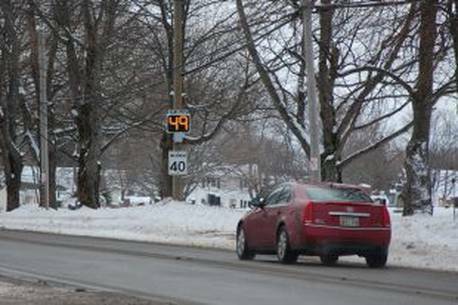 Ms. Biggar: It’s having the sign there at the appropriate place and monitoring the speed in that area. Mr. Trivers: Okay. Just as a way of a head’s- up, I know that there’s – the Home and School group, and some of the residents that live along Route 2 at that location where that accident – there’s been a number of close calls – are definitely going to be, perhaps, putting forward a petition to have that sort of thing up. Mr. Trivers: Maybe we can head that off at the pass. Ms. Biggar: – would just encourage them at this point – they don’t really need to make a petition. Mr. Trivers: All right. Great. Ms. Biggar: – on it. Mr. Trivers: Thank you, minister. Chair: Thank you, hon. member.